To mark the sesquicentennial of Texas’ Declaration of Independence, the Houston Symphony Orchestra’s composer-in-residence, Tobias Picker, conceived and brought to fruition the Fanfare Project: substantial fanfares commissioned from 21 composers (including Elliot Carter, Charles Wuorinen, John Adams, Steve Reich, John Harbison, Christopher Rouse, Jacob Druckman, Joan Tower, Carlisle Floyd, Marius Constant and John Williams), one to be played at the start of each subscription program of the 1986–1987 HSO season. 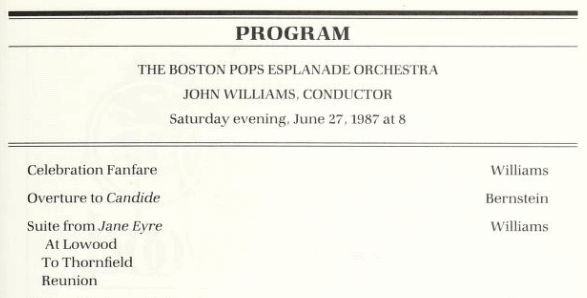 Williams’ contribution (termed “fugally bucolic” by a Houston Post critic) was premiered on September 6, 1986, conducted by the Houston Symphony music director Sergiu Comissiona. in a concert later broadcast on radio around the country. This work has never been commercially recorded. The orchestral score and parts to this work are not commercially available; a piano arrangement appeared in both the John Williams Anthology and Fanfares and Themes.